This weekend Sinn Féin will hold a major conference in Dublin to launch the party’s campaign for a Border poll. The poll - of all voters in the North - is possible because of the Belfast Agreement, which is 15 years old this Easter. It allows for a Border poll and a simple majority vote to determine the constitutional status of the North. Such a poll would provide an opportunity for a historic debate on the future of this island. Sinn Féin believes that the time is right to seek a Border poll to end partition. The adverse impact of partition means that the economic potential of the island of Ireland has been severely stunted. The additional and unnecessary costs of running two competing economies and states on an island this size; the inefficiencies in the duplication of essential public services; and a relatively small population have added significantly to the financial, political and social consequences faced by citizens. Partition created two conservative states on the island. In the North, this led to institutionalised and structured discrimination and sectarianism, and to nine decades of division and conflict. However, despite the efforts of tiny minorities to cling to the past, the peace process has dramatically changed the situation. One consequence of this is that the political geography of the North has begun to change. 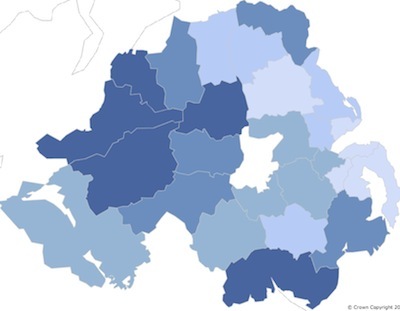 The Northern state was gerrymandered to allow for a permanent unionist two-thirds majority. But the recent census figures reveal a shift that gives hope that political dialogue, stability and persuasion can achieve even more deep-rooted change. For too long there has been a presumption that Protestants are unionists and Catholics are nationalists or republicans. It was never that simple. Now, for the first time, statisticians have been able to ask a question about identity. Less than half the population (48 per cent) designated themselves as British and northern Irish or Irish, while 40 per cent stated that they had a British-only identity. A quarter stated that they had an Irish-only identity and just over one-fifth (21 per cent) had a Northern Irish-only identity. That’s 46 per cent with some form of Irish-only identity. Statisticians and politicians will argue over the significance of this. But what is certain is that the North is in transition. It is no longer an orange state. In addition, there is a closer scrutiny taking place of unionist claims that Irish unity is uneconomic. The 10.5 billion pounds subvention figure is often cited by unionists and the British. However, the British refuse to reveal how much revenue is generated in the North. An analysis of Department of Finance figures suggests the figure is likely to be closer to 4.5 billion pounds. Sinn Féin believes all parts of the island will financially benefit from an end to the duplication of services on the island and from an all-island economy. In the South, the enormous economic changes of recent decades, the diminished influence of the Catholic hierarchy, and the disclosure of corruption in the golden circles and in politics, have dramatically and fundamentally changed societal attitudes. So, politics across this island is in flux. A new Ireland can be what we make it. The Border poll is a key element of this. It provides an opportunity to focus on the future: to build a modern, dynamic, new Ireland - in which there is genuine reconciliation, and out of which a more equitable society can emerge. Of course this is a huge challenge. Change is not easy. But change is necessary. And those of us who want to shape that change, so equality and a rights-based society can prosper, have a duty to proactively listen to the concerns of unionists. They are fully entitled to be part of this process and the new Ireland which emerges has to be one that reflects their rights alongside the rights of other citizens. That in many ways will be the test of our endeavours.